The day has finally come as many has long predicted and hoped: Facebook today filed its S1 registration. The day has finally come as many has long predicted and hoped: Facebook today filed its S1 registration. We’re combing through the numbers at present–we’ll update as we get a better grasp on the figures–but here are the initial highlights. Net income for 2011 reached $1 billion in 2011, on revenue of $3.7 billion, up from $606 million on revenues of $1.97 billion in 2010. Unsurprisingly, the vast majority of Facebook revenue comes from advertising–roughly $3.2 billion in ad revenue in 2011. Revenues from payments generated only $557 million; remarkably, 12% of Facebook’s revenue come from Zynga. Facebook has $3.9 billion cash on hand, and the company also revealed in its filing specific usership figures: 845 million monthly users at the end of 2011, with roughly half of those users active on a daily basis. Facebook is now seeing more than 250 million photos uploaded to the service everyday. 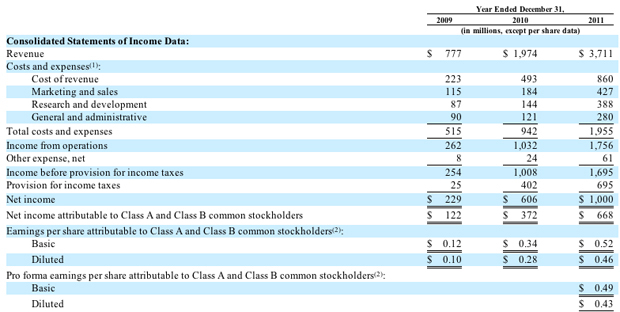 The filing also gave more insight into Facebook’s shareholders–the IPO Player’s Club, as we’re calling it. CEO Mark Zuckerberg owns an astounding 28.4% of Facebook. At a valuation of $100 billion, that would mean Zuck’s stake would be worth roughly under $30 billion. Other top shareholders include, of course, Peter Thiel, who stands to make about $2.2 to $2.5 billion from his shares. In terms of salary, Zuck’s base was set at $500,000 in 2011, not including stock options or bonus. He will reduce his salary to $1 in 2013. 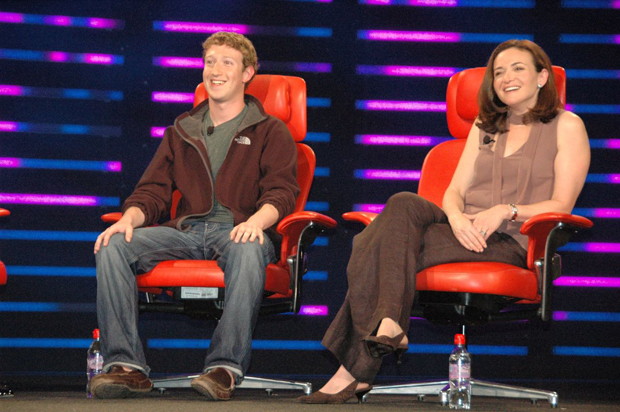 Facebook CEO Sheryl Sandberg had a base salary of $300,000 in 2011. Facebook gave more insight into its competition as well, describing Google and Google+ as one of its main competitors–more fuel for the Great Tech War of 2012. Other competition, Facebook said in its filing, came from Microsoft and Twitter, “which offer a variety of Internet products, services, content, and online advertising offerings, as well as from mobile companies and smaller Internet companies that offer products and services that may compete with specific Facebook features.” These might include startups such as Instagram and Foursquare. In a letter to prospective investors, Zuck also took the time to tell them about the “hacker way,” harkening back to our 2007 profile on the Facebook founder. Read more of our coverage of Facebook’s S-1 filing and impending IPO.